The well-known comic bookstore Midtown Comics in New York City arranged for a special variant cover of Black Panther #1 as well. The cover was produced by artist Mark Brooks. The cover suggests Black Panther's links to the broader family of cats by showing other panthers and a lion. 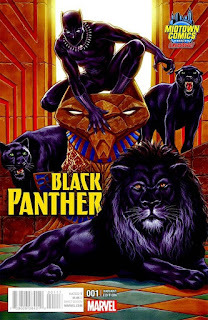 The image also depicts Black Panther crouching on a large cat-like sculpture. The lion and sculpture, with the colorful accessories, signal royalty. After all, T'Challa/Black Panther, is the ruler of Wakanda. In mid-March, Brooks shared his step-by-step process of drawing and coloring the cover on Facebook. He later shared the process on Tumblr, and the site Bleeding Cool posted the stages of the cover along with Brooks's comments.